A federal judge's unusual ruling Monday against the Federal Trade Commission might not be the last unexpected twist in the agency's case against a Pennsylvania hospital merger, experts say. Typically, the FTC drops its challenge to a hospital merger when it fails to win a preliminary injunction in federal court. But experts say it's possible the FTC, in this case, might continue its fight against the merger despite its loss in the federal district court. The FTC had sought a preliminary injunction to temporarily stop the merger of Penn State Milton S. Hershey (Pa.) Medical Center and Harrisburg-based PinnacleHealth System, both in Dauphin County, pending the agency's own administrative proceedings, but the judge denied that request. 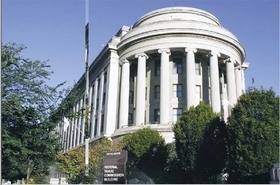 FTC spokeswoman Betsy Lordan said Tuesday the agency has not yet announced what it will do next. At this point, the FTC could drop its challenge, or it could appeal the decision in federal appeals court, or it could continue to move forward with its own administrative proceedings on the legality of the merger without the preliminary injunction. If it found the merger unlawful in those administrative proceedings, however, it would then have to attempt to unwind a deal already underway. But Jeff Miles, an antitrust expert at law firm Ober Kaler, also said he's not so sure the FTC will simply walk away from the case, as it has done in the past. The agency likely has serious concerns with the methodology the judge used to define the geographic market in the case, Miles said. U.S. District Court Judge John Jones III wrote in his ruling against the FTC's preliminary injunction request that the agency had too narrowly defined the systems' geographic market by not accounting for the distances many patients travel to reach the hospitals. He also wrote that the FTC did not include enough hospitals in its definition of the market. The judge seemed to have used a market-defining methodology that was commonly used in the 1990s, Miles said, instead of a more recently embraced methodology in which hospitals constitute a geographic market if it is found they could profitably raise prices once combined. The newer methodology tends to result in smaller geographic markets than the older one. The FTC may be concerned about the effects the decision might have on other cases against hospital mergers, including a current case in a Chicago district court over a proposed tie-up between Advocate Health Care and NorthShore University HealthSystem, Miles said. Some of the points of contention in that Chicago-area case are similar to those in the Pennsylvania ruling. “My guess is, if you used the methodology this judge used in the Advocate case, the judge there would also find the FTC's market was too small,” Miles said. Also, the FTC may find some of the language the judge used in his Pennsylvania ruling disturbing, Miles said. In that ruling, the judge swiped at the FTC for challenging hospital mergers in a changing healthcare environment. Both Greaney and Miles cautioned, however, that it's difficult to know exactly what the FTC's next move will be. Miles, for example, noted that if the FTC were to continue battling the Pennsylvania systems, that could give ammunition to those backing a bill currently before Congress that the FTC opposes. The bill, the Standard Merger and Acquisition Reviews Through Equal Rules (SMARTER) Act, would make the processes by which the U.S. Department of Justice and the FTC review mergers the same. That bill, among other provisions, would eliminate FTC administrative hearings, requiring the agency to work through merger challenges solely in the courts. The American Hospital Association backs the bill, saying that the threat of an FTC challenge now deters many hospitals from pursuing potentially lawful mergers because of the time and cost involved in litigating a case, first at a preliminary injunction hearing in court, and then in FTC administrative proceedings. The bill passed the House in March by a 235 to 171 vote. FTC Chairwoman Edith Ramirez has spoken out against the bill, saying the FTC's administrative process has helped shape antitrust law and led to many successful challenges. She argued that the bill is unnecessary partly because the FTC rarely holds administrative hearings after a loss at the preliminary injunction stage. “Given the SMARTER Act, the FTC may be concerned that if it takes this case to an administrative hearing, it's going to be criticized for taking two bites of the apple,” Miles said.